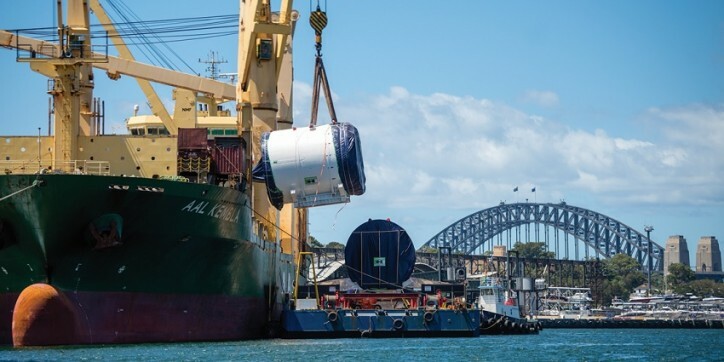 AAL reported earlier today that in February the Company successfully completed a major shipment of two mega tunnel boring machines (TBMs) from Nansha in South China to Sydney and Melbourne respectively, equipment that will help progress important new multi-billion-dollar metro railway projects taking place separately in the two state capitals. The two units and their components totaled over 7,445cbm and 2,000mt in weight and were shipped aboard the 31,000dwt heavy-lift MPV, the AAL Kembla, on behalf of Geodis Hamburg. The two TBMs were manufactured by world-leader in heavy tunnel boring machines, Herrenknecht AG and this is the sixth shipment of such units that AAL has been commissioned to operate in the past eight months on the manufacturer’s behalf, via its selected logistics partner, Geodis Hamburg – all cargo destined for Australian infrastructure projects. The Larger of the two units on this shipment (weighing almost 1,000mt) is part of a 130-metre long boring machine named TBM Kathleen. She is the last of five mega borers for the Sydney Metro City & Southwest Project and will help to build twin 15.5km railway tunnels deep under Sydney Harbour – eventually enabling underground transport of passengers in state-of-the-art driverless trains.